Four red pandas on loan to Ocean Park from the Chengdu, China Research Base of Panda Breeding arrived in Hong Kong on March 22, 2009, Sunday night. They were named Tai Shan, Rou Rou, Cong Cong and Li Zi. They will begin their 30-day quarantine and acclimatisation before meeting the public at the new mega-attraction ¨C the ¡®Giant Panda Adventure: Amazing Asian Animals'. 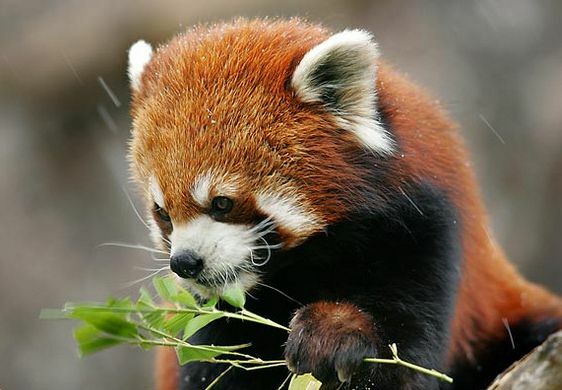 Red pandas are different from giant pandas. They are smaller and look like a raccoon, although their bodies and tails are longer. Their natural habitat is the Himalayas and mountains of Western China and Northern Myanmar. Red pandas, on average, are about 105 centimetres long and weigh about 5.5 kilograms. Giant pandas are much larger and look like bears. They are mainly black in colour, with patches of white. Adults weigh from 90-140kg and are 140-150cm long with a 13cm tail. Giant pandas live in the Chengdu region of Sichuan province and are protected by law. The four red pandas in Hong Kong, which include two males and two females, about eight to nine months old and the second generation of red pandas bred there. The MTR Corporation will build an extension of the Shenzhen Metro that will help connect Hong Kong and a new town north of Shenzhen city. Phase two of the Shenzhen Metro Line 4 will consist of 10 stations running through northern Shenzhen, including Lianhuabei, Longhua new town and Qinghu. It will connect with the line's phase one, which is managed by Shenzhen and comprises five stations starting from the Futian checkpoint. This means that passengers using the MTR's Lok Ma Chau spur line can get off at Lok Ma Chau, walk through the station lobby to Futian and board the metro to reach northern Shenzhen. The MTR Corporation (Shenzhen) signed a concession agreement to operate Line 4 for 30 years. Investing HK$5.8 billion, the company will design and build the extension, which is expected to start operating in 2011. The MTR Corp is also working on arrangements to enable passengers to commute with the Octopus card and a Shenzhen equivalent system in both cities. A team of railway staff from Hong Kong and the mainland were to undertake the development. China transport governments would study whether the Guangzhou-Shenzhen-Hong Kong Express Rail Link could be connected to the extension to improve the regional network. People from other provinces living in Shenzhen will be allowed to apply for Hong Kong visas through the individual visit scheme without returning to their home provinces. Also, permanent Shenzhen residents will be allowed to apply for multiple-entry visas to Hong Kong. Visa rules open door for more Shenzhen residents to visit Hong Kong that would tentatively start before January 5, 2009. The two new measures will hopefully help to bolster Hong Kong's economy. It may not only increase the number of visitors under the individual visit scheme but it can also offer more convenience for trading activities between Hong Kong and Shenzhen. Shenzhen has a population of 8.6 million, of which about 2.2 million are permanent residents who will be eligible to apply for the new one-year multiple-entry visas. However, there has been no announcement on a much-anticipated expansion of the individual visit scheme to other second- and third-tier mainland cities but it has been considered to expand it from the current 49 cities. The tourism sector, hit by a fall in long-haul visitors as the financial crisis deepens, and the Commerce and Economic Development Bureau welcomed the measures. It is estimated that the number of mainland visitors would rise by 5 per cent, to more than 16 million per year, and offset the loss of long-haul visitors. Hong Kong residents have made more than 10 million visits to Shenzhen every year and this new arrangements would allow Shenzhen residents to visit, shop and celebrate different occasions in Hong Kong more often. The Hong Kong Observatory has cancelled all typhoon signals on Wednesday, at exactly 12.50pm. The observatory said that typhoon Hagupit was moving away from the territory. At 2pm, Hagupit was centred about 100 kilometres west-northwest of Zhanjiang, China and is forecast to move west or west-northwest about 16 kilometres per hour across Guangxi, China. Some parts of the territory were still experiencing rain and winds. Tai O — a fishing village on the western of Lantau Island — is one area of Hong Kong most affected by heavy flooding caused by the typhoon. The Islands District Office said it had been co-ordinating efforts by government departments and non-government organisations to help to residents in Tai O, a spokesman for the District Office said. The Islands DO made arrangements for the Civil Aid Service to help residents clearing the sand and mud from their houses. Volunteers will go to Tai O on Thursday to offer assistance to affected inhabitants. The Food and Environmental Hygiene Department has been removing debris and rubbish from streets. While the electricity supply has been restored in Tai O, action will also be taken by the Islands DO to help households whose electricity supply has not resumed. Staff from the Islands DO have been deployed to the Tai O Rural Committee to provide assistance to residents. So far, some 100 requests for assistance had been received. However, they will continue to monitor the situation and make every effort to provide appropriate assistance to the residents. Residents who are affected by the flood and have financial difficulties may apply to the Island DO for emergency relief funds. The Islands also has made available a temporary shelter for residents who are in need. When Hagupit hit Hong Kong on Tuesday, the No 8 signal was raised – for the fourth time this year. There were 16 reports to the government of flooding, seven of collapsed scaffolding and 46 of fallen trees. The weather caused major problems for residents who live on Hong Kong’s outlying islands. Many Cheung Chau residents had to vacate their homes on Tuesday night. This was after the ground became unstable, as rocks beneath them were washed away. Most Hong Kong people returned to work, after leaving early on Tuesday, but many schools remained closed on Wednesday. The Education Bureau announced that day schools, including afternoon primary schools and kindergartens, would still be suspended on Wednesday afternoon. Public transport companies had resumed normal services on Wednesday morning. Airlines out of Hong Kong and most ferry services have reverted back to their usual schedules. As Hagupit moved towards Guangdong, China on Wednesday morning, the observatory lowered its No 8 typhoon signal to No 3. Authorities in Guangdong and Hainan have called back more than 70,000 ships to the harbour and evacuated about 100,000 people from typhoon-prone locations.